LIULI was established in Tamshui, Taiwan in 1987 as Asia’s first Liuli workshop and stands today as Asia’s largest Liuli arts brand. Loretta Hui-shan Yang and Chang Yi are the co-founders of LIULI and lead the brand as Creative Director and Brand Manager respectively. LIULI operates 70 galleries around the world. Since in 1987, the company has expanded throughout Taiwan, Shanghai, Beijing, Singapore and Malaysia. 2008 brought the first two stateside galleries in San Francisco and New York. Over twenty-two years LIULI creations have been acquired by internationally renowned museums for their permanent collections and LIULI works have been exhibited in over 30 countries and territories. At least 32 world leaders have received the gifts that are made from LIULI series works; LIULI collection was once bestowed upon VIP members of the Annual Academy Awards and Grammy Awards. 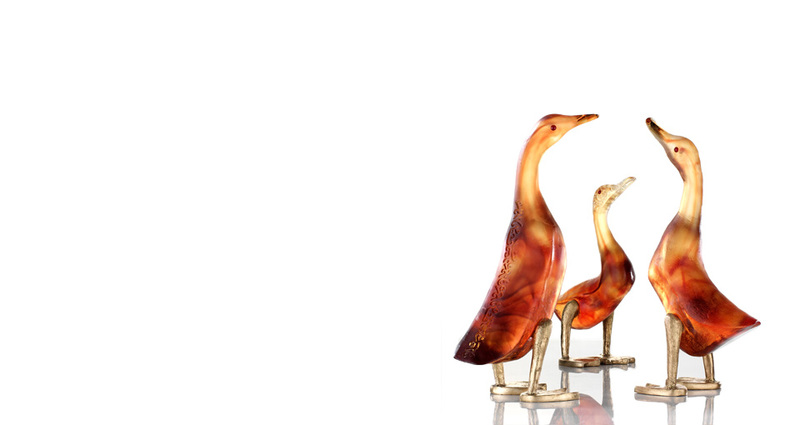 In the span of twenty years, LIULI has opened the doors for and given new life to the lost art of Chinese Liuli. Through untiring experimentation, Yang and Chang went from pâte-de-verre novices to experts in the field. Their emphasis has always been on Chinese culture and history and in terms of the value of craft, has always insisted on a hands-on approach. Each LIULI creation goes through an twelve-step process, lasting a total of six to eight weeks. In addition, each series is part of a limited collection, driving the team to constantly create new works. LIULI’s launching point is always in the aspect of material. They scrutinize the myriad of possibilities held by contemporary lifestyle design and push Liuli to pass the boundaries of accessory and craft to incorporate it into modern culture and life. TMSK Restaurant opened in 2001 as a hand-crafted Liuli theme restaurant. With no other establishment like it, TMSK quickly garnered the attention of the culinary and design worlds in addition to traditional media outlets. New York Times, Wallpaper, ELLE, BBC and NHK are among those that have profiled the restaurant. The trend started by TMSK has become a model for interior design in China and beyond. GNPS(Guan Nian Pei Shi ) is an accessory brand Loretta Hui-shan Yang creates for women. By flawlessly combining Liuli with 925 silver, the brand accentuates the female concept and value. It has come to represent the new female perspective. LIULI LIVING, contemporary furniture design, brings Liuli into everyday life. Drawing from Chinese elements, LIULI LIVING aims to become the largest specialty furniture brand in China. From a design standpoint, it is aesthetic, creative, and exploits the multi-faceted characteristics of modern day living. In 2005, The Hong Kong Design Centre awarded LIULI’s LIULI LIVING with the “Design for Asia Award (DFAA) for Most Influential Design Brand.